← Bitcoin! To regulate or not to regulate?! 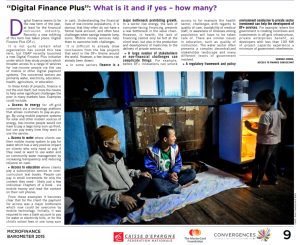 Ok, ok, ok my article in the Microfinance Barometer is not a blog, but I still thought it might be interesting to feature it here. Digital Financial Services PLUS seem to be THE new thing in our sometimes a little odd world of access to finance. I had already written about DFS+ in Tanzania in an earlier blog, but hopefully the Microfinance Barometer 2015 will reach a lot more people. 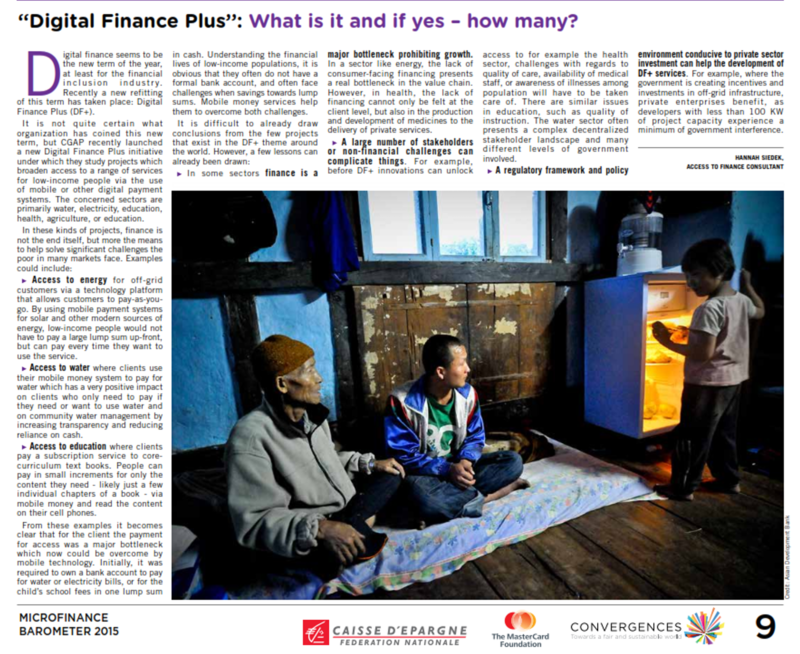 For the 6th consecutive year, Convergences has published the Microfinance Barometer, in partnership with Fédération nationale des Caisses d’Epargne, The MasterCard Foundation, Caisse des Dépôts, the European Microfinance Platform (e-MFP) and Oikocredit. This annual publication contains up-to-date figures at world level and in France, analyses the major trends of the sector and takes a look at the new opportunities of microfinance in the countries of the global North and South. Here it is exclusive for you: ” Digital Financial Services +:” What is it and if yes – how many? Digital finance seems to be the new term of the year, at least for the financial inclusion industry. Recently a new refitting of this term has taken place: Digital Finance Plus (DF+). Access to energy for off-grid customers via a technology platform that allows customers to pay-as-yougo. By using mobile payment systems for solar and other modern sources of energy, low-income people would not have to pay a large lump sum up-front, but can pay every time they want to use the service. Access to water where clients use their mobile money system to pay for water which has a very positive Impact on clients who only need to pay if they need or want to use water and on community water management by increasing transparency and reducing reliance on cash. Access to education where clients pay a subscription service to curriculum text books. People can pay in small increments for only the content they need – likely just a few individual chapters of a book – via mobile money and read the content on their cell phones. From these examples it becomes clear that for the client the payment for access was a major bottleneck which now could be overcome by mobile technology. Initially, it was required to own a bank account to pay for water or electricity bills, or for the child’s school fees in one lump sum in cash. Understanding the financial lives of low-income populations, it is obvious that they often do not have a formal bank account, and often face challenges when savings towards lump sums. Mobile money services help them to overcome both challenges. In some sectors finance is a major bottleneck prohibiting growth. In a sector like energy, the lack of consumer-facing financing presents a real bottleneck in the value chain. However, in health, the lack of financing cannot only be felt at the client level, but also in the production and development of medicines to the delivery of private services. 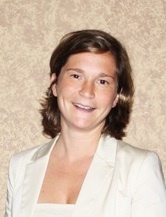 A large number of stakeholders or non-financial challenges can complicate things. For example, before DF+ innovations can unlock access to for example the health sector, challenges with regards to quality of care, availability of medical staff, or awareness of illnesses among population will have to be taken care of. There are similar issues in education, such as quality of instruction. The water sector often presents a complex decentralized stakeholder landscape and many different levels of government involved. This entry was posted in Allgemein and tagged access to finance, digital financial services, financial, impact investing. Bookmark the permalink.